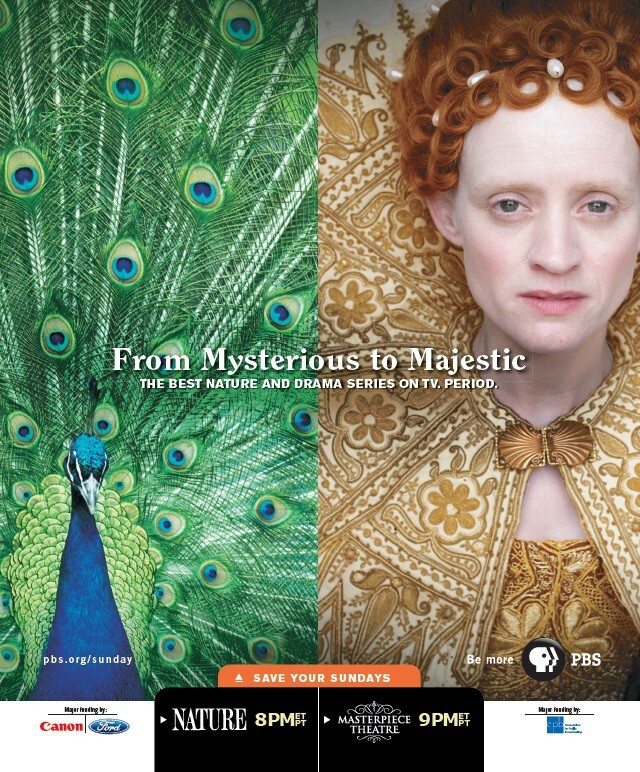 CHALLENGE: Promote the six most popular TV series on PBS, which all air on three different nights. This was daunting because we had to wrangle and streamline a lot of information. SOLUTION: Focus each ad on one night (featuring two unique shows that air back-to-back). We found conceptual similarities between the two series and developed “mirror images” to reinforce their connection. This visually shows you how the two shows run one after another. And, the headline reinforces the time / day in a creative, memorable way. RESULTS: This campaign improved significantly the ratings for these series. Our campaign was so successful that we continued it for 30 months with nearly 30 distinct executions. Media included magazines, metro, bus shelters, and outdoor. EXECUTION: “Peacock” – this ad uses mysterious imagery to promote both Nature and Masterpiece Theatre, which air back-to-back on Sunday nights.